I’m a cleaner in a hospital in the West Midlands. I’m at the bottom of the tree, pay-wise, but my work helps the clinical staff to keep the hospital safe and free from infection and makes a difference to patients. I want you to understand why I feel so let down by your decision not to give me a fair pay rise. I know there is a big gap between your wages and mine. You are apparently worth millions. My pay is less than £300 per week. So I know you don’t have to make the choice between buying food or paying your electricity bill. I know you haven’t had to cope with the shame of applying for help from a food bank or worry about spending a third of your wages paying off short term loans needed to cover the gaps between pay checks. So I don’t think you are in the best position to understand how I feel about your decision not to increase my hourly rate, even by the stingy 1% recommended by the Pay Review Body. The thirty five thousand NHS staff like me who earn less than the living wage of £7.65 have been clobbered by increases in costs – the ‘inflation rate’ for those at the bottom of the earnings pile is estimated to be around 25% since the crash. Paying us the recommended hourly uplift would have at least gone some way to helping me make up the gap. If you had done what the Pay Review Body recommended (and what staff in Scotland will get) then the 1% would have been added to my hourly rate, meaning I could have worked more hours and tried to make up my costs that way. Paying just a flat amount will mean my pay in 2016 will be at the same rate as in 2013. Me and the other staff on the bottom pay points feel as if you are telling us we are not worth a measly 1%. I feel that there is a big and growing gap between the haves and the have nots in our society. The more I read about the lives and earnings of those making decisions about my pay, the more I realise that you cannot possibly have any idea about what it is like to try and manage like we do. Your decision means I am likely to be pushed into relying on in-work benefits. I work hard and I think that people like me are worth the dignity of a job that means I can live without handouts. Very well done & said Mary. I hope you get a decent reply & not just a short drafted one from his aid. My wife was a nurse for some 35 yrs so she knows just how hard & essential everyone’s work is. As a minister for the same length of time I’ve seen daily how hard everyone works. These people who live in Ivory towers think only of themselves, & will just run us into the ground, if we let them. I’ve seldom seen staff at all levels so dispirited & demoralised as they are today! I wish you, all the very best, most of us really appreciate the work you do & just how essential it all is. This is an excellent letter to Hunt. I, like Rev.Cole,hope you get a proper answer and not one that doesn’t actually address any of the issues raised ( like the ones I get whenever I contact Craig Whitaker, my Conservative MP.) I was a nurse for almost forty years, and know that EVERYONE working in a hospital is part of a team, not one member of that team better than another.We couldn’t do our jobs without us all co-operating with each other. Good Luck Mary, I hope that the government after the next election will realise , and reward, the workers who have been hardest hit by the recession. Well said, Mary. Excellent letter. I only wish that it were read by the person to whom it’s addressed with the same conviction and compassion that you put into it. Brilliant letter. Good hospital care depends on the whole team and cleaners are very important in the teams. Jeremy Hunt is a millionaire like so many of the other cabinet ministers and has no idea why a fair pay award can make a difference to people. Keep up the pressure, NHS workers deserve decent pay. Thank you for your courageous letter which eloquently explains your situation. I hope Jeremy Hunt will be bold enough to respond to himself. Hospital cleaners ensure patient safety and contribute a towards high quality care in a clean environment that reduces risk of hospital acquired infection. A clean environment will also lead to patients recommending their friends and family to the hospital. This clearly demonstrates how valuable your role is. Therefore you and other workers in N’S deserves to be adequately renumerated. You are worth more than 1% and deserve more than 1% and I hope you get it. Having a rather complicated medical condition I have had my fair share of hospital visits in my time and have the up most respect for all those working in hospitals. I think Hunt dismissing a 1% pay rise is an indication as to the different world they live in. 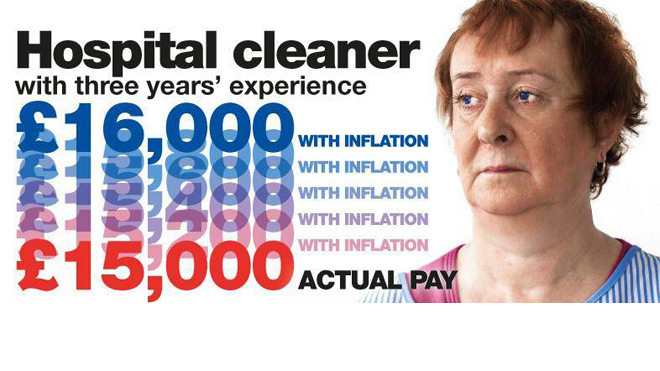 I worked as a carer in nursing and residential homes for a few years and also got little more than the minimum wage. Your job is so important in keeping hospitals safe and hygienic for patients and those working there, but I also know that often your quick chat or even warm smile to a lonely or scared patient can mean so much. As a public sector worker myself we all need to stick together and get a fair increase in pay relevant to the cost of living. Keep fighting and God bless. Until a government removes the “market” from the NHS and establishes a range/spine of hourly rates of 5 to 1 ( the lowest paid earns 1/5th of the highest paid person(s) in the NHS) then I don’t think you will get any joy from his reply to your letter. I was a cleaner in a NHS hospital. I was put on bedwashing. I was given induction training on how to do it. The whole process took 45 minutes. After a few weeks I got the tjme down to 35 minutes. However, my boss said I needed to get the time taken down to 15 minutes. This is not possible. I left that employment. To clarify, bedwashing involves cleaning all the area surrounding the hospital bed; chair, locker, window sills etc. besides disinfecting and turning the mattress and cleaning the bed base. In an ordinary business organisation with a maximum ratio of say 20 to 1, I would have no objection to a CEO paying himself £3 million pa if as a result the person who cleaned the CEOs office got 1/20th (5%) of that, i.e. £150,000 pa. Houses would then be affordable and the benefit bill would be cut. Fair pay for all, I say. Well said, I used to work for Dixon’s on below minimum wage. I couldn’t afford to eat properly, Despite sharing my home with a friend. We had no furniture, we had to eat beans on toast for most meals. On Sundays I would add an egg. It was not sustainable. We need living wages! That’s all very nice but it’s rarely Hunt who decides the wages of hospital cleaners. Many hospital are in control of their budget and how they spend it. Then cleaning in most hospital is contracted out to private companies like ISS which are the one who decide of the wage. It’s the competition between different companies for a limited pot of money that lead to poor pay for workers. This goes back to when Labour started privatising the NHS because running it publicly was inefficient and expensive. And it’s not only cleaning. Have you notice that outpatient pharmacy are privately run? Why is it that the public sector can’t run basic services without huge loss is the question. Never a truer word spoken!! I was a child and adult that has had to spend too much time in and out of hospitals. The one thing that never changed was the level of responsibility from the cleaning staff they personally felt they had to obtain high levels of hygiene for the sake of patients and staff to function. And the one thing that stood out was their ability to bring a smile to your face or brighten up your day with friendly conversation or simple ‘hello’ often seeing the same cleaner over a few days. They were the ones most likely to notice you, how you felt and how long you were a patient. That is worth such recognition from mr hunt to give them a decent pay rise to enable them to obtain a well deserved standard of living just as you yourself has! And after all are you members of OUR GOVERNMENT THAT WE ELECTED ON OUR BEHALF TO LISTEN TO OUR VIEWS AND IMPLEMENT THEM TO THE FULLEST? NOT BENEFIT OFF OUR BLOOD, SWEAT AND TEARS?!!!!!! It saddens me to think we live in such unfair society. I always considered Britain as one of the World’s leading country, when it comes to life comfort and wealth. Couldn’t be more wrong! I work 56 hours per week on above minimum wage, yet cannot afford to rent place of my own. The housing prices are ridiculous, the food prices are shocking and everything else is just far too expensive! Britain is getting poorer with every inflation…we see rise of homelessness every year ! More and more people turn to mental health services for help…current lifestyle puts so much pressure on each individual, struggling to meet the ends needs, yet the Government and Bankers give themselves pay rises,like there was no tomorrow! I think this country needs an upraising and protests against this behaviour…this cannot go on much longer !